My good friend, Ron Honberg, has officially retired as NAMI’s Senior Policy Advisor, a post he has held since 1988. Ron was one of the first advocates who reached out to me after my son, Kevin, had his first psychotic break. 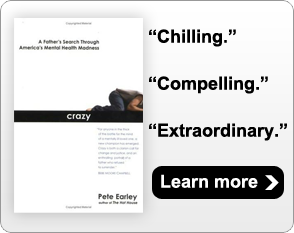 Later, after I published my book, CRAZY: A Father’s Search Through America’s Mental Health Madness, Ron and I often appeared together on NAMI panels and at mental health conferences. He was a strong supporter of Crisis Intervention Team Training and alternatives to incarceration. Ron always was fair-minded and often got stuck with calling me after I posted a blog that upset NAMI’s leadership. More importantly, he was a tireless advocate who cared and fought hard for families and their loved ones with mental illnesses. A lawyer by training, Ron filed a number of important briefs on behalf of NAMI. He is someone who I greatly admire and respect. I am certain he will continue to advocate on some level but his many friends will miss his daily service to NAMI. He was one of its best. In addition, Kenneth J. Dudek will retire as president of Fountain House in New York City. I often refer to Ken as “Mr. Clubhouse” because he is responsible for promoting the clubhouse model both nationally and internationally, giving individuals with mental illnesses a strong voice and developing groundbreaking programs that address housing, employment, educational, and health needs. Since Ken took charge in 1992, Fountain House has been repeatedly honored, the most famous award being the Conrad N. Hilton Humanitarian Prize. I’ve always admired Ken’s soft-spoken, common sense reasoning. Most of all, I’ve appreciated how he kept true to Fountain House’s origins. We also will be losing Linda Rosenburg as president and CEO of the National Council for Behavioral Health in August this year. I’ve had the pleasure of serving on the board of the Corporation for Supportive Housing with Linda and also speaking and appearing on panels with her. It would be difficult to find someone who is as well-versed about financing mental health services and as shrew politically in Washington D.C. as Linda is. During her 15 year stint, Linda helped pass the Mental Health Parity and Addiction Equity Act and helped create Certified Community Behavioral Health Clinics, as well as, introducing Mental Health First Aid to the United States. If you ever attended a NatCON convention, you would easily understand why membership under Linda tripled to more than 2,900 organizations. One convention featured her rapping about mental health. Linda has been fearless in calling out politicians who either have harmed or are indifferent to mental health. I’ve always admired her no-nonsense style. As with Ron and Ken, her retirement will be both a huge loss to our cause and to me personally. Finally, there’s new blood in my local mental health district. Michael T. Lane has been hired as the new Director of Individual and Family Affairs director in Fairfax/Falls Church. Before joining our local Community Service Board (CSB), Lane was the Consumer Affairs Coordinator for Mental Health America of Northern California. He is a nationally certified peer specialist, certified psychiatric rehabilitation practitioner, certified WRAP facilitator and Wellness Works trainer. He holds a Masters Degree in Education. If you live locally, you might recall that when the last top peer left that job, the CSB decided to save money by not hiring someone to fill his spot. I wrote a blog condemning this decision and eventually those in charge decided to fill the opening left by Tom Mangano. Michael resembles Clark Kent of Superman fame, often getting double takes. So he played it up when he was married in 2012.